Underground drinking water sources in parts of the U.S. and three Asian countries may not be as safe as previously thought due to high levels of manganese, especially at shallow depths, according to a study led by a researcher at the University of California, Riverside. Manganese, a metal that is required by the body in tiny amounts, can be toxic at elevated levels, particularly in children. Samantha Ying, an assistant professor of environmental sciences in UCR's College of Natural and Agricultural Sciences, led the study, which was published recently in Environmental Science & Technology. The paper describes manganese levels that exceed World Health Organization (WHO) guidelines in groundwater wells in Bangladesh, Cambodia, China, and the Glacial Aquifer, which spans 26 states in the northern U.S. and provides drinking water to more than 41 million Americans. Of the four regions, the Glacial Aquifer had the fewest contaminated wells. 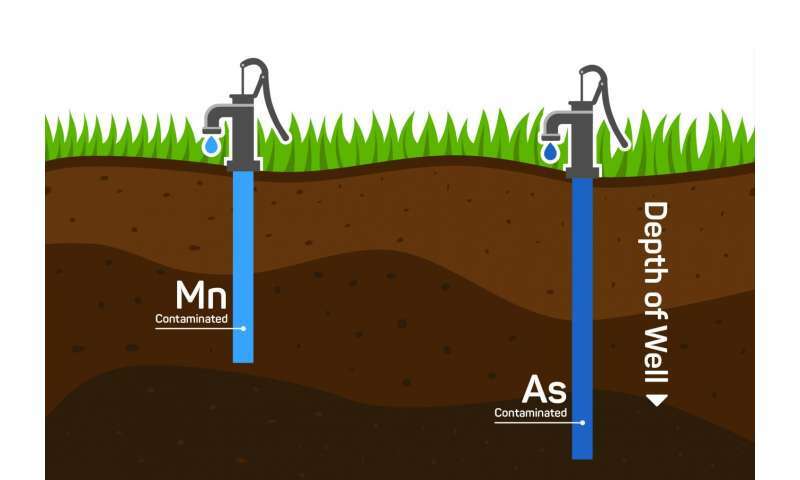 While groundwater can be contaminated with a number of heavy metals, more emphasis has been placed on assessing the levels of arsenic than manganese, although the latter also poses a threat to human health. Levels of arsenic, a known carcinogen above the WHO's guideline of 10 parts per billion (ppb), are enforced by the Environmental Protection Agency (EPA) in the U.S. and similar agencies in other countries. Although the WHO suggests a health-based limit of 400 ppb, manganese is not listed as a contaminant on the EPA's National Primary Drinking Water Regulations, and therefore the levels are not monitored or enforced. A growing number of studies have linked abnormal manganese concentrations in the brain to neurological disorders similar to Parkinson's disease, and elevated levels in children may negatively impact neurodevelopment and cognitive performance. In the current study, the researchers collected and analyzed chemical data from 16,000 wells in the Glacial Aquifer, the Ganges-Brahmaputra-Mehta Basin in Bangladesh, the Mekong Delta in Cambodia, and the Yangtze River Basin of China. The researchers studied the levels of arsenic and manganese at a range of depths, showing that, in general, arsenic levels increased with depth, while manganese levels decreased with depth. -Glacial Aquifer (U.S): 9.3 percent contaminated when considering arsenic only; increased to 16.4 percent when considering arsenic and manganese. -Ganges-Brahmaputra-Mehta Basin (Bangladesh): 44.5 percent contaminated when considering arsenic only; increased to 70 percent when considering arsenic and manganese. -Mekong Delta (Cambodia): 10 percent contaminated when considering arsenic only; increased to 32 percent when considering arsenic and manganese. -Yangtze River Basin (China): 19 percent contaminated when considering arsenic only; increased to 88 percent when considering arsenic and manganese. Ying said omitting manganese from water monitoring protocols means public health officials are dramatically overestimating the number of safe wells in some regions. However, while arsenic contaminated wells should be avoided completely, manganese contaminated wells can be treated inexpensively or be used for agriculture rather than drinking water. "Providing access to safe drinking water is a global challenge that is increasing the demand for drinking water from underground sources," Ying said. "However, due to increasing knowledge on the detrimental impact of manganese on human health, particularly on children, manganese levels in these sources should be monitored more closely and governments should consider introducing manganese drinking water standards. Ying said since the highest manganese concentrations were not found at the same depths as the highest arsenic concentrations, these contaminants can and should be evaluated separately to ensure groundwater is fit for human consumption or agricultural use.